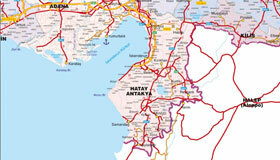 Hatay is a province in the southest of Turkey. Located on the east cost of the Mediterranean Hatay is bordered by Syria to the south and east, by the Mediterranean to the west, by Adana to the north-west, by Osmaniye to the north and by Kilis and Gaziantep to the north-east. It has a population of 1,503,066. Hatay is one of the oldest settlements in Turkey. Researchers say that according to the available information the history of the settlement of this region goes back to the middle paleolithic period by hundred thousands BC, that can also be extended up to 2.5 millions years. Antakya is the biggest district of Hatay. According to the historical resources, it was founded in around 300 BC by Seleucus I Nicator that was one of the commanders of Alexander the Great. Orontes River that flowing through the middle of it is vitally important. Due to its historical and natural beauties Antakya is one of the cities that should be seen in any case. The city is rich of religious and historical tourism by especially like St. Pierre Church, Antakya Castle, historical Antakya houses, Hatay Archaeological Museum. Harbiye, where our hotel is located, is a quarter of the district of Defne in the province of Hatay. It is a settlement for centuries. Its historical name is known as Defne or Daphne. Harbiye that has excessive green areas and is famous for the beauty of its waterfalls is a frequented place as well as a place for accommodation and entertainment for the tourists coming from the countries of the Middle-East due to its geographical position located on the road connecting the Middle-East with Turkey. Hatay Archaeological Museum is an art museum, where the pieces belonging to the ancient period are exhibited. It is said that it has the world second biggest mosaic pieces collection. The most of the pieces exhibited in the museum consist of the mosaics from the Roman period in Antakya. The most of these pieces were discovered during the excavation works between the years of 1932 and 1939. The St. Pierre Church consists of a cave with a depth of 13 m., a width of 9.5 m. and a height of 7 m. created by caving the rocks on the west of the Stauris Mountain in Antakya. This cave that was used by the first Christians in Antakya for their secret meetings is accepted as the one of the oldest churches of the Christianity. It is known that the Christianity was firstly spread out in Antakya as well as for the first time the believers of this religion were called Christians. In the history the Titus Vespasianus Tunnel is the first tunnel in the world that was built by hand. It is thought that these are the tunnels that were built by about one thousand slaves under the authority of Titus known as Titus in the first century A.D. in the district of Samandag in Hatay to prevent the flood water coming from the mountain, and whose construction took more than a century. The Titus Tunnel with a length of 1,380 m. is one of the places that should be visited before leaving Hatay. Besikli (Cradle) Cave being situated near the Titus Vespasianus Tunnel is a cemetery from the Roman period. In this cemetery that was caved in the lime plates on the rocky hillsides there are twelve graves. It is asserted that these graves are the graves for the kings, however, it is thought that in fact twelve of them belong to the Roman governors and the prominent residents of the city of Seleucia Pieria. At the places other than these cemetery graves there is a big necropolis. Arsuz is a historical and touristic district on the coast of the Mediterranean in Hatay. In the center of Arsuz there are Mario Hanna Church, which is one of the oldest churches in the world, and Mary-Pool, in which it is thought that Mother Mary had bathed. In addition, about 10 km. away to the south of Arsuz on the beach of Konacik Village there are the rests of ancient harbour from the helenistic period. Arsuz provides also the needs of the summer tourism of the region with its beaches. Despite employing the industrial production with time, the traditional silk cultivation that began around 4600 years ago for the first time in China, is still being continued in some places in order to hold this tradition. Also the regions of Harbiye and Samandag of Hatay are among these places, where traditional pure silk cultivation is made. Silk that is textiled on the traditional benches and getting the shapes of different products attracts the interest of the domestic and foreign tourists.